Comedian and actress Nicole Byer feels excited about being Conan O’Brien’s friend! Nicole and Conan sit down to chat about loving the people they torment, marriages of convenience, Ayahuasca side effects, Conan’s dateability, and making your own tattoos with Microsoft Word. Later, Conan recaps a texting miscommunication during a game of True or False with Sona Movsesian. This episode is sponsored by VRBO, Yousician (www.yousician.com/CONAN code: CONAN), Robinhood (www.CONAN.robinhood.com), State Farm (1-800-STATE-FARM), Mizzen+Main (www.comfortable.af code: CONAN), Fracture (www.fractureme.com/CONAN), and HotelTonight (www.hoteltonight.com). Actor, writer, and director Ben Stiller feels excited to be Conan O'Brien's friend, but he isn’t holding his breath. Ben and Conan sit down this week to chat about growing up in show business, getting the finger from strangers, returning to Saturday Night Live, how Ben came into his latest project Escape at Dannemora, and being able to make yourself laugh. Plus, producer Matt Gourley shows off a piece of true presidential memorabilia. This episode is sponsored by Twix, Stamps.com (www.stamps.com code: CONAN), and State Farm (1-800-STATE-FARM), Article (www.article.com/CONAN), and Hair Club (www.hairclub.com/CONAN). This episode is sponsored by FX - What We Do in the Shadows, SoFi (www.sofi.com/CONAN), Calm (www.calm.com/CONAN), Campaign Monitor (www.campaignmonitor.com/CONAN), Fracture (www.fractureme.com/CONAN), Hair Club (www.hairclub.com/CONAN), MeUndies (www.meundies.com/CONAN), Capterra (www.capterra.com/CONAN), and Audible (www.audible.com/CONANOBRIEN or text CONANOBRIEN to 500500). This episode is sponsored by Mercari (www.mercari.com), TWIX, Stamps.com (www.stamps.com code: CONAN), Article (www.article.com/CONAN), and Mizzen+Main (www.comfortable.af code: CONAN). Writers Jessie Gaskell and Mike Sweeney feel hungry and starving, respectively, about being Conan O’Brien’s friends. Jessie and Mike sit down with Conan to talk about their new show ’Inside Conan: An Important Hollywood Podcast,’ moving to the second floor, office snacks, and Gene Simmons. This episode is sponsored by Simple Contacts (www.simplecontacts.com/CONAN code: CONAN), Fracture (www.fractureme.com/CONAN), and ButcherBox (www.butcherbox.com/CONAN). Actress Lisa Kudrow feels tired about being Conan O’Brien’s friend. Lisa and Conan sit down to chat about their first meeting at an improv class, not taking criticism personally, the backlash to Friends, how Lisa predicted Conan’s career, and being rescued from their dreams. This episode is sponsored by Mercari (www.mercari.com), Mizzen+Main (www.comfortable.af code: CONAN), Athletic Greens (www.athleticgreens.com/conan), Campaign Monitor (www.campaignmonitor.com/CONAN), Robinhood (www.conan.robinhood.com), State Farm (call 1-800-STATE-FARM), HotelTonight (www.hoteltonight.com), and Bombas (www.bombas.com/CONAN). Actor Timothy Olyphant feels “eh” about being Conan O’Brien’s friend. Timothy and Conan sit down this week to chat about their favorite hobbit names, playing a mean mofo on-screen, buying a gingerbread house, and fantasies of quitting Twitter. Plus, Conan’s wax figure controversy heats up with an official response from the Dreamland Wax Museum. This episode is sponsored by State Farm (www.statefarm.com), Mercari (www.mercari.com), ZipRecruiter (www.ziprecruiter.com/CONAN), Article (www.article.com/CONAN), ButcherBox (www.butcherbox.com/CONAN), Mizzen+Main (www.comfortable.af code: CONAN), and Athletic Greens (www.athleticgreens.com/CONAN). This episode is sponsored by Athletic Greens (www.athleticgreens.com/conan), Kendra Scott (www.kendrascott.com code: CONAN), ButcherBox (www.butcherbox.com/CONAN), Campaign Monitor (www.campaignmonitor.com/CONAN), Fracture (www.fractureme.com/CONAN), Hair Club (www.hairclub.com/CONAN), Mizzle+Main (www.comfortable.af code: CONAN), and Capterra (www.capterra.com/CONAN). Comedian and actor Dana Carvey feels masculine about being Conan O’Brien’s friend. This episode is sponsored by Campaign Monitor (www.campaignmonitor.com/CONAN), tasc Performance (www.tascperformance.com code: CONAN), State Farm (1-800-STATE-FARM), Fracture (www.fractureme.com/CONAN), HelloFresh (www.hellofresh.com/CONAN80 code: CONAN80), Kendra Scott (www.kendrascott.com code: CONAN), and MeUndies (www.meundies.com/CONAN). Comedian and actor Adam Sandler feels stunned to be Conan O’Brien’s friend. This episode is sponsored by Campaign Monitor (www.campaignmonitor.com/CONAN), Hotel Tonight (www.hoteltonight.com), Simple Contacts (www.simplecontacts.com/CONAN code: CONAN), ZipRecruiter (www.ziprecruiter.com/CONAN), tasc Performance (www.tascperformance.com code: CONAN), Capterra (www.capterra.com/CONAN), Away (www.awaytravel.com/conan20 code: CONAN20), and Hair Club (www.hairclub.com/CONAN). Comedian, actor, and podcaster Marc Maron feels nervous about being Conan O’Brien’s friend. Marc and Conan sit down this week to chat about beginner podcast tips, difficult interviewees, health scares, and why they don’t hang out. Plus, Conan receives feedback on his showmanship from his assistant Sona during a new segment called Ways In Which Conan Is Like Freddie Mercury. Got a question for Conan? Call our voicemail: (323) 451-2821. For Conan videos, tour dates and more visit TeamCoco.com. This episode is sponsored by Campaign Monitor (www.campaignmonitor.com/CONAN), Athletic Greens (www.athleticgreens.com/CONAN), tasc Performance (www.tascperformance.com code: CONAN), and HotelTonight. Actress Kristen Bell feels supercharged about being Conan O’Brien’s friend! Kristen joins Conan to chat about imparting kindness to their kids, Kristen’s complex relationship with her husband’s recliner, driving motorcycles, and Conan’s goals for a potential double date. For Conan videos, tour dates, and more visit TeamCoco.com. This episode is sponsored by BAKblade, Bolster Sleep Company (www.bolstersleep.com code: CONAN), Hair Club (www.hairclub.com/CONAN), MeUndies (www.meundies.com/CONAN), and Roman (www.getroman.com/CONAN). Comedian and actor Will Ferrell feels awkward about being Conan O’Brien’s friend. Will joins Conan along with trusty assistant Sona Movsesian and producer Matt Gourley to reflect on his unmatched commitment to comedy, sharing humble roots with Conan at The Groundlings, feeling good about bad reviews, and remembering the comedy bit Will performed on Late Night that got them both in trouble with Lorne Michaels. Plus, Conan answers questions from fans about hair, Star Wars, and staff favorites. Got a question for Conan? Call our voicemail: (323) 451-2821. Will Ferrell’s new movie Holmes and Watson opens in theaters December 21st. This episode is sponsored by BAKblade, Bombas (www.bombas.com/CONAN code: CONAN), Bolster Sleep Company (www.bolstersleep.com code: CONAN), ZipRecruiter (www.ziprecruiter.com/CONAN), and No Kid Hungry (www.nokidhungry.com/conan). The first episode of Conan O’Brien’s new podcast is less than two weeks away. 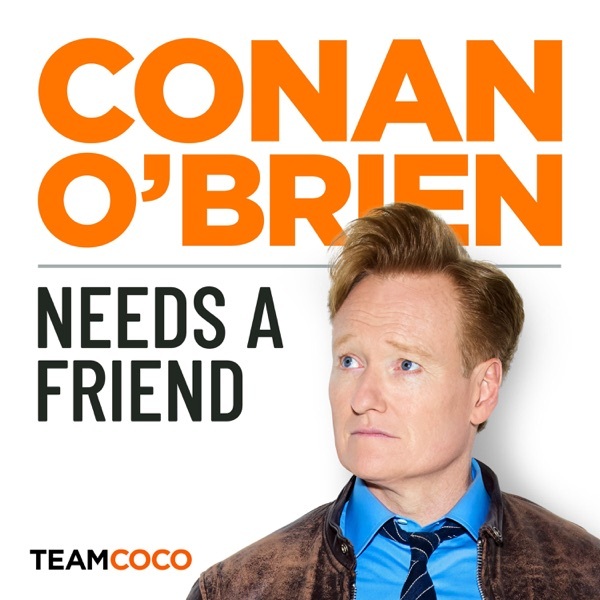 Conan really needs a friend. But does he need a podcast? Turns out he does. If only to find that friend. So Conan's bringing his favorite celebrity guests by the studio for some lively conversations. Look out for episodes with Will Ferrell, Nick Offerman and Megan Mullally, Wanda Sykes, Marc Maron, Bill Burr, Kristen Bell, Dax Shepherd, and more! Subscribe now in Apple Podcasts, Stitcher or wherever you listen. Conan O’Brien really needs a friend. But does he need a podcast? Turns out he does. If only to find that friend. Conan's bringing his favorite celebrity guests by the studio for some friendly conversations. In the meantime, he is joined by his dependable assistant Sona Movsesian, in an attempt to figure out why a venerable TV legend like himself might want to start a podcast in the first place. Is it really for the friendship, or just the fortune and glory? Or is it maybe to show everyone else just how wrong they’ve been doing it up to now? Weekly episodes start this fall. Subscribe now so you don't miss the biggest podcast event of the year!